Our former boats — Elizabeth, a Bristol Channel Cutter 28 and Daphne, a Nor’sea 27 were fantastic blue water boats! Both designed by Lyle Hess, they are hard acts to follow. Both were built like tanks, and made to go anywhere. In this post I want to talk about a few of their on deck features we really liked, which have become features we seek in our new sailboat. The BCC 28 did have wonderfully wide side decks. There was plenty of room to get by the shrouds without getting stuck, or having to contort ones body. There was room enough to lash a spare diesel tank without stubbing your toe. Also, the mast, mains’l and winches were all accessible at deck level. Cabin tops, upon which you must climb to work at the mast make for a high and unstable work platform in lumpy seas. We like the security of being able to remain low while at the mast. The NS 27 has possibly the most comfortable cockpit ever. The aft cabin provided a perfectly angled backrest and secure area for being comfortable while on watch. Watches can be long, and being comfortable in the cockpit is paramount. Comfort allows you to stay out longer and keep a better watch, while an uncomfortable cockpit inhibits your ability to concentrate on the important tasks. The cockpit on Daphne also doubled as a fantastic under-the-stars double bunk! I’m an advocate for getting to the mast to work your lines. I’m not in favor of “lines led aft” (See Ben’s SAIL Magazine article, page 26, April 2013). Winches on the mast are the only place to raise, lower and reef sails. Forget the spaghetti in the cockpit, the rope clutches, the snags, the chafe, the frustration. It’s not worth it. On Elizabeth, winches were on the mast where you can look up and see what’s happening with your rig, especially important when reefing. Underway, the helm is for both steering and keeping a proper lookout. The common practice of putting a TV screen sized chart plotter in front of the helmsman is counter productive. At night, those screens are blinding. I know I can’t see any stars, flotsam, or even distant ship lights when I’m staring at a plotter all night long. Instead, just give me a compass, a tiller (or wheel) and a dimly lit depth sounder. 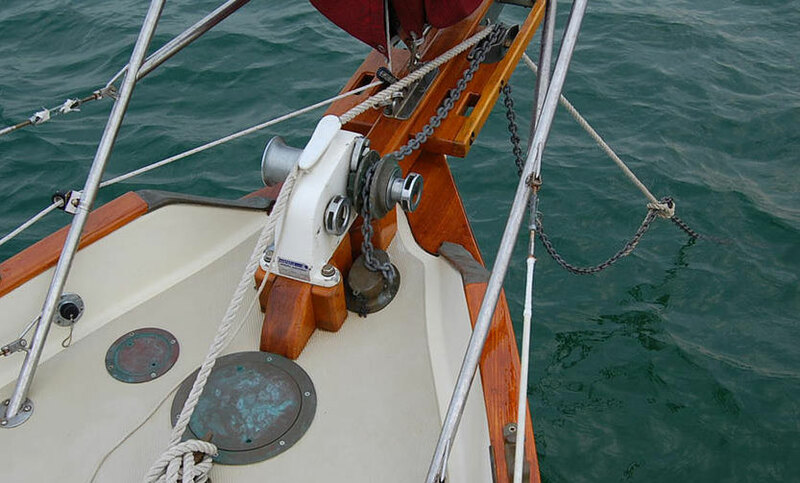 If the anchor is the heart of a good ground tackle set up, then the windlass is the backbone. Both our BCC and NS had manual windlass’ mounted on the foredeck, with a spill pipe. Trap doors that reveal a hidden windlass and store chain near deck level are a recipe not only for corrosion, but also more difficult anchoring. Both our boats had a bowsprit of sorts that helped keep the anchors away from the hull. The anchor rollers/fairleads were stout and designed to take a load from nearly any direction, not just straight ahead. The simplicity of a sloop rig is enticing. 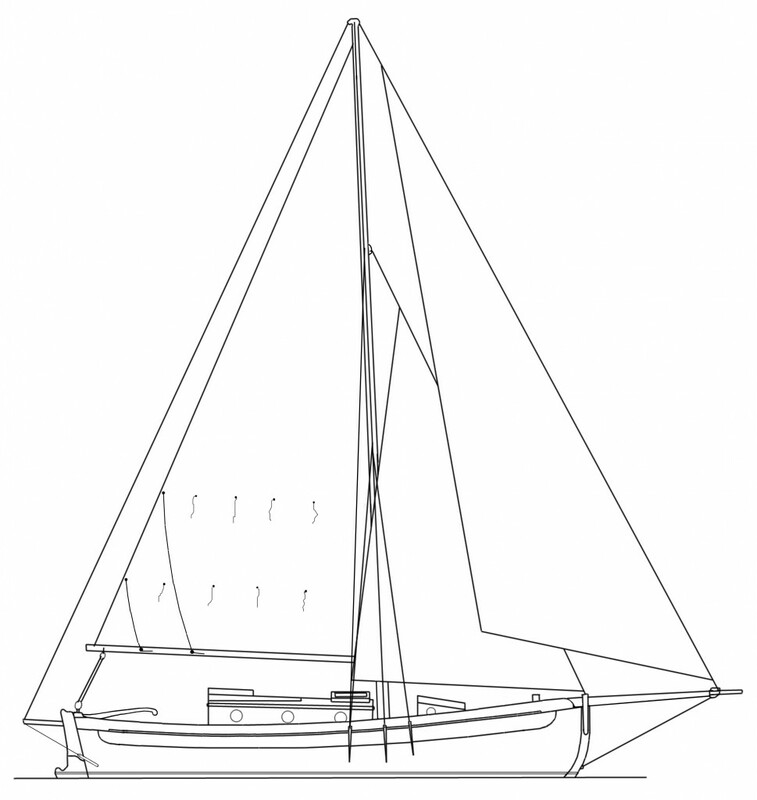 But adding a single inner forestay offers an additional easy option for heavy weather sail plans. Although you need to balance that inner stay with either running backs or intermediate stays, our feeling is that it is completely worth it. When the wind piped up, we simply dropped the jib, and sailed under the stays’l. The full or modified full keels on our BCC and NS provide the boat with a steady track and a wide landing pad for intentional hull dryings. Our moderately heavy displacement and wineglass hull shape offered an easier motion at sea. The protected rudders and props reduced our stress over fishing lines, lobster pots and other potentially destructive debris in the water. Hull speed is a function of waterline length. Overhangs are sure pretty, but for us, maximum waterline length is prettier. While speed is not our highest priority, making the most of our hull is. Each of our Lyle Hess designed boats had water line lengths that were about 92% of the length on deck, thereby making efficient use of their overall length. So these are just a few of the things we loved about our former boats. Tell us what features you love about your boat or are seeking for your next boat in the comments. Liked this post? Subscribe to email updatesand get loads more! I was told that a full keel, a keel-stepped mast and a shallow cockpit that’s difficult to swamp and easy to drain… all the features my Ericson 27 lacks… are a must if you want to make it through any kind of weather out there. Is there any truth to that? Am I forever stuck in the bay? Everyone has their own ideas about what is important. But there are plenty of boats sailing offshore with deck stepped masts, particularly steel boats, they are nearly all deck stepped. There are lots of fin keel boats that people take offshore like the popular Hallberg Rassy. I do think that a fast draining cockpit is important when on a small, low freeboard boat. But there are other considerations as well: hull deck joint, keel attachment method, bulkhead attachment and placement, and other structural details that should be investigated. Thanks for comment and thought provoking questions. Calling the Hallberg Rassy a fin keel is a bit misleading. Sure its not a full keel but a mix in between but they are smooth in the water. In my opinion whats important is the motions the boat makes sailing, you need it to have a smooth transition in the direction changes, for example when going against the waves, you want your boat to smoothly transition from downwards motion to upwards. Same with the rolling motion, if it’s jerky and tough it will make you uncomfortable after a while. A boat that lets you live in it while under sail is a clear choice, sure it would be nice to have that kingsize bed when nicely tucked into an anchorage, or that big kitchen, but as long as I can cook food, sleep well and stand up while putting my foulweather gear on while under way in most weathers I’m good. But a long/full-keeled boat with an aries or a monitor back behind the tiller is always a good start. Just some of my opinions in a world of different views on sailing. Any rowboat could go anyware with a lot of luck and the best Coast Guard boats designed to be rolled over will sink with some bad luck. The major factors after luck are the Capitan/crew (knowledge/physiology/planning) and preparation (tools/supplies/charts/equipment). Just pay a lot of attention to the weather forecast, have a large general purpose storm anchor with lots of scope, EPIRB, radio, survival suits, inflatable and always try to have a safe harbor nearby. Unless you plan to cross an ocean almost any destination can be reached by many short hops of much less than a week. I agree that keel shape is very important, however I don’t think you need to limit yourself to a full keel for seaworthiness. I have a contessa 32, which has a modified fin keel, and it is widely regarded as one of the safest and sturdiest small sailing boats for heavy offshore weather. A couple have even rounded Cape Horn! Its all about proportions and proper placement, which I’m sure the poster would agree with. And with all boat design with every advantage comes sacrifice, my contessa has an almost 6ft draft. Love your guys blog and keep living the dream! I’ll agree with you Adam. We now own a fin keel boat. There are plenty of great seaworthy boat designs out there. But the full keel still beats out when it comes to groundings, lobster pots and other obstacles! All excellent Pros and Cons! I agree. Thanks for sharing and commenting. Not at all. 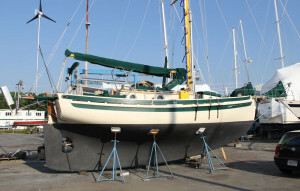 At least one Ericson 27 sailed across the Pacific and back (San Francisco to Japan and return trip). Of course, the keys are thorough preparation of your boat, and good seamanship. Love this post. I don’t think I’ve ever before seen the features of a proper cruising sailboat explained so clearly and succinctly. Although we now live on a Manta 42 catamaran, we think that Island Packets meet all of the criteria noted, wide deaks, cutter rig, ground tackle, heavily built, full keel and comfortable cockpit. We sailed our IP 350 from the Great Lakes to the north coast of South America, visiting 16 countries, encountering a lot challenging weather and the boat was never an issue. Island Packets are produced in a full range of lenghts and can therefore accomodate the space needs of living aboard for long periods. It is hard to match the beauty of the boats designed by Lyle Hess. The Bristol Channel Cruiser and the Nor’Sea are beautifully designed. Wow! I had no idea that Elizabeth had such a full keel. I have only seen pictures of her in the water. 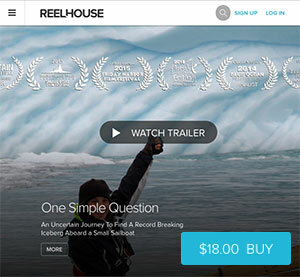 That is a serious keel! I might be in the minority these days but I prefer a deck stepped mast, they seem to produce less noise, and don’t have water draining through into the bilge. I like completely dry bilges. The other benefit to a deck stepped mast is that it can be stepped and un-stepped without a crane, We did this on a Wauquiez 43, it was scary but we did it. I looked at serveral Nor’sea 27’s and the one thing that really got me was the amount of through hulls, one of them had 13, I prefer none. Another top priority to me is simplicity, I have worked on boats that were an absolute nightmare to rig, it seems that every item added, lines to cockpit, lazy jacks, single line reefing, anything electric, just adds to the confusion and danger of things to go wrong. If you kill your battery you are dead in the water. Last but not least affordability, I have 1400 boats in my harbor, my best guess is 90% of the owners cant afford their boats. A Columbia 24 built in 1965 will safely sail you anywhere in the world if its properly rigged and maintained. We agree on the thru hulls, less is better. 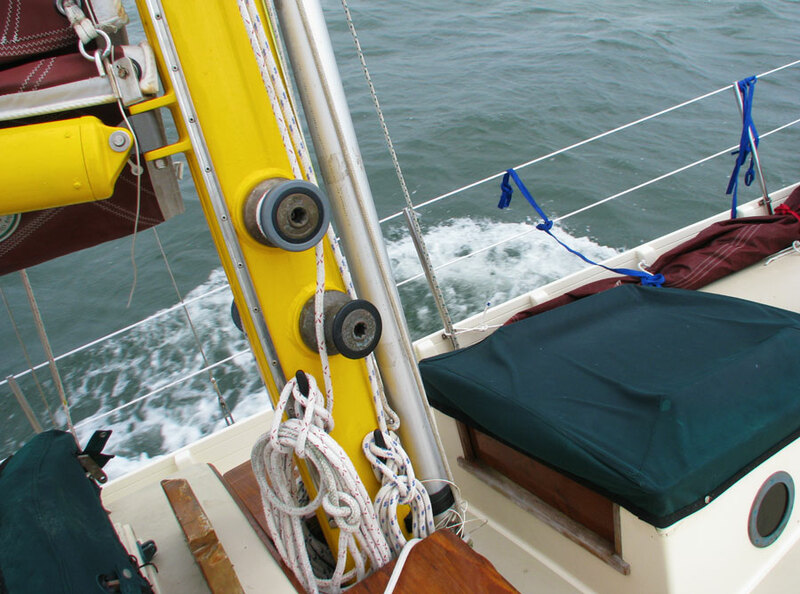 Deck stepped is a great solution, especially on smaller boats where you can lower the mast yourself. Alot of larger steel boats have deck stepped masts as well. Thanks for your input. We’ve been enjoying your blog lately. There were several things that we looked for in our boat. One was dry storage above and below the waterline. If we’re going to be living aboard we need placed to put things. Having a full keel and a protected rudder. I have never really been crazy about keel stepped mast, for one the hole in the deck will leak at some point and water will be collecting in the bilge. The down side is you have to be more careful about deck compression issues. A safe working galley is importand with hand holds to grab onto. Rounded edges below decks in any wood work or trim to soften falls or slips into them. Lastly, a usable head that is small enough that you can brace yourself while using it, but also have good storage. Also, a seprate shower that can be used for a wet locker, kitty litter area and the occasional shower. Excellent Dave. You’ve beat me to it – I was going to talk about some interior living space things we like in the next post! We definitely need a good kitty litter solution 🙂 Another pro deck stepped mast comment… I’m keeping tally. Thanks for the insight. Lots of good suggestions. I would like to add comfortable motion at sea and high bulwarks. While preferable to walk the deck to windward, high bulwarks give footing to leeward if needed, help stop dropped items, and offer better protection of slipping overboard than most liveliness. Bob, good point, high bulwarks provide great security. They are definitely something we cherished on the BCC. A tiller no wheel with all its complications. Connected to a transom hung stoutly built Rudder. Oh and i know that were all diferent and look for different things but the boat has to be beautiful. I love this topic and while this might be a slight hijack I would say the number one contributing factor is the captain, not the boat. Here is a story about a popular production boat that met with about every single failure known to man. The one thing that did not fail was the production boat, every failure experienced was that of the captain and after market products installed on a production boat, IE there is way more to it than the hull and deck. http://www.equipped.com/0698rescue.htm My 22′ Westerly crossed both the Atlantic and Pacific, she was too small, too light, and generally a very slow boat. When i sold that boat she was 27 years old, ready to go again and outfitted as well as any boat. i guess where I am going with all this is all boats sailing in open sea should be considered blue water, some are more fit for long distance voyaging than others, You don’t have to be 1000 miles from shore to discover the strengths or weakness of your boat. The most traumatizing experience I have had at sea in over 25 years happened less than 8 miles off the west coast of Catalina Island in Southern California which is considered to be one of the safest places to sail in the world. Thank you for a nicely written summary! (And nice responses too!) My wife and I are embarking on our dreams of sailing into our golden sunset (before we’re too old to enjoy a bit of adventure) and as we work on our modest boat we take note of likes and dislikes. I’m an engineer so I believe in simplicity over “ease” every time. We choose self-reliance because…well, being self- reliant is just part of what makes us yearn for the sea, isn’t it? We look forward to reading more (and more from other readers!) and thank you for sharing your knowledge and experiences! Fair winds and following seas! This comment will go down in history. It is forever on the internet as the first one posted by the mysterious “Bob.” It is absolutely app pro pro that you mention the Ranger 23. She did point high. Speaking of gentlemanly sailing, for the passage maker that’s not racing, lower aspect ratio rigs are an excellent choice for the boat that spends the majority of its time sailing on reaches or downwind. Certainly, this would include lower aspect Marconi rigs. While I wouldn’t suggest looking at the exclusively (because good ones for sale are so rare,) if you can find a good one, a gaff or junk rigged boat can be an excellent offshore option. Signing off with “I remain …..” suggests a devotee of the unparalleled Aubrey-Maturin Series has taken an interest in this fascinating discussion. I have a couple of questions. I don’t have that much sailing experience. I started racing over 2 years ago on a friends Olson 30 about 1-3 times a week, and only recently started living aboard a friends Tayana 52 (it stays in a marina most of the time, goes to the channel islands on weekends). When I go educate myself from/about people who are lifetime blue-water cruisers, I see the same points made in this article over and over again, however there is usually some clarification lacking. I fully agree with #1 and #2. 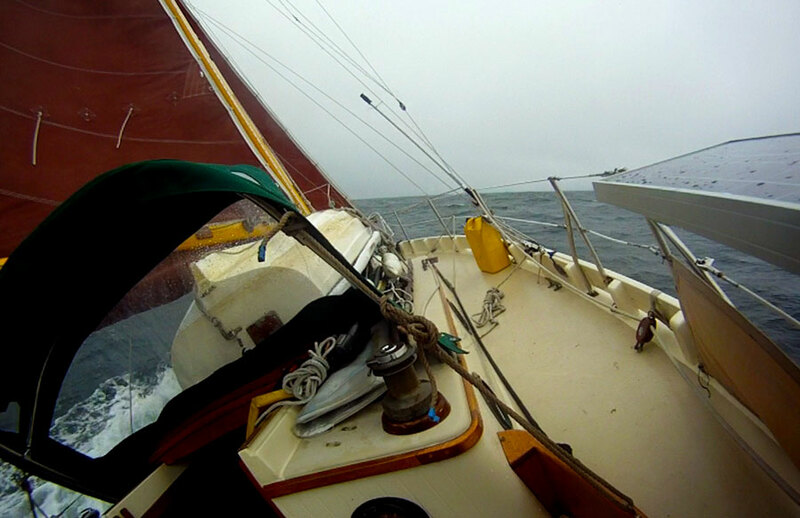 Having spent time in an Olsen-30’s cockpit during a 4 hour race, cockpit comfort is premium, and while the Tayana has a great side-deck, the shroud and jib-sheets(off a furler) create a complicated (but navigable) hazard if you’re walking forward of the mast while underway. I find myself thinking it would be much nicer if the chainplates were external. I want to find myself agreeing with #3 and #4, but I’d like to understand where the blue-water people are coming from. For instance, on the Tayana, (being a fairly modern plastic boat) of course most everything is routed back to the cockpit. There is a winch on the mast, but the owner never uses it. I’m actually not certain at this point why its there, or what the line flaked around it is for. The Olsen is the same. Granted, when I’m on the Olsen, there’s plenty of muscle and any job that needs to get done gets done in time to round the next mark, so there’s lots of hands to tidy up lines. And to be honest I haven’t actually sailed on the Tayana much, as the few times we’ve been out, there either wasn’t enough weekend free time to make it to an island and back or the conditions weren’t great for a trip. However, on first glance, I see nothing wrong with having 2-3 rows of cleated lines near a few winches near the cockpit bulkhead. The owner of the Tayana has all his reefing lines run back there, and I can certainly look up and see the main and rig from either side from the pit, so I’m not certain why visibility while reefing is better from the mast. I will say, the one thing I dislike is all the added friction from the extra routing blocks. I’m certain it adds another 5-10lbs of force to trying to furl/unfurl that jib. As to #4, I can easily see the always valid point of keeping a clutter-free helm. I’m actually curious why no one has tried to address this concern about visibility and screens in the cockpit though. I come from a physics/engineering background, so to my mind it’s actually a trivial matter to create a dimly lit screen that takes more effort to see/notice at night than the stars. I’m certain I could hack a kindle static display to be entirely innocuous on a sailors night vision, yet provide radar/maps/weather when necessary (perhaps when having a red flashlight shone on it). Frankly, when I think about boat electronics I get embarrassed for the industry, they haven’t addressed a real sailors concerns at all, they keep going higher power consumption, higher throughput, higher visibility, and greater handicap to your abilities whenever one piece of it is disabled for any reason. The electronics packages you see in sailboats also have zero-hackability. These systems should be using things like Arduino and other home-built electronic kits to make it possible for sailors to keep spares of and restore electronic function AT SEA. The biggest complaint from sailors about electronics on board is that they’ll fail and there’s no way to restore function of them at sea. There’s no way to prevent the failures. However, there’s plenty of ways to make systems that work on <$20 spare parts that any sailor can have shipped to them in a few days, or keep boxes of available on board, ready to reboot the device. Anyway, just wanted to share those thoughts. Thanks for your comments! Great thoughts. As for #3 and #4 – the entire situation changes when your offshore with 55 or more knots of wind and huge swells. Clutter, friction, visibility, all of it becomes a major problem that might not ever be understood unless you and your boat are tested to the limit. Its at those limits when some “upgrades” that are supposed to make things easier, start to show their problems. Most sailors don’t sail offshore. They enjoy their boats on the weekends or evenings and stick close to home because they have other priorities in their lives. I think thats why its so common to see set-ups and gadgets that wouldn’t fare as well offshore, but are still very popular. In most cases, they are fine. The other thing to recognize is that most coastal sailors don’t set sail in extreme stormy weather. In many situations, that would be foolish. But when you’re offshore, however, you can’t tuck into a cozy harbor, or simply stay home when the storms roll in. 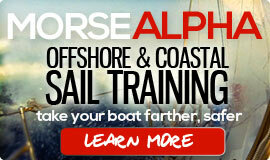 Thats why people who sail offshore boats have different requirements for their vessel. Ben wrote a GREAT article in Sail Magazine this month all about lines led aft to the cockpit. He makes a great argument with lots of reasons why winches on the mast are important, and halyards in the cockpit are trouble. After this month’s run of Sail Mag, I’ll post the article on this blog. Sign up for our e-newsletter or Facebook page so you can get notified when its posted. Thanks for your comment! I hope to hear more from you in the future. You have great thoughts and great questions. Hmmm… difficult to continue the conversation from that video Teresa. What you seem to be telling me is that technology should be rejected whenever possible. Which, ironically, is an engineer’s proper creed just restated. The best engineer is that which engineer’s least. Rejecting a technology is perfectly valid if what is available is unsuitable for the conditions expected over the life of the “mission” (sorry couldn’t find a better word there). My best argument against the rejection of GPS/Radar/etc, is that those are technologies just like sails are a technology (sails have simply been around a lot longer). I find no end-game to the argument to simply not use something because we might be capable of doing without, because eventually you can justify just swimming across the pacific (hopefully during an el-nino with lots of food floating around). Now, if someone offers you a gadget that is expensive and will only work until it gets wet, obviously that’s worth rejecting. But if someone gave you a box of sticks that when arranged in a square made a GPS receiver, and spares were smaller than pencils and cheaper than paper, you’d probably say yes. We keep sails because they survive a lot of sun and water, and can be rather easily repaired. We often (properly) reject expensive instrument networks because they’re unreliable and complicated. I’m suggesting that the electronic hacker portion of the internet is mature enough that all on-board electronics of your average high-end coastal cruiser could be replaced by inexpensive and small electronic platforms that hackers use every day. I’m suggesting that the electronics involved in making those instruments work are just as simple and easy to repair as sails these days, if you approach the problem from the perspective of a sailor. Unfortunately market forces probably won’t bring a lego solution to the sailors. Such an arrangement would have to be tried and tested at sea of course. Too funny! Of course I wouldn’t recommend swimming across the Atlantic. I’m not an extremist, and not that foolish either. There is a balance to find and its different for every person. I get concerned when too much technology compromises a person’s ability and likewise too little technology can do the same. I wish you could see the full talk and not just excerpts! It might make more sense then. I don’t think technology should be “rejected whenever possible.” I try to maintain a conscience use of technology. I thought it was well put when you said that technology “hasn’t addressed a real sailors concerns at all, they keep going higher power consumption, higher throughput, higher visibility, and greater handicap to your abilities whenever one piece of it is disabled for any reason.” But they handicap abilities even when they are fully functioning….to much to get into right now. I could write essay upon essay about it and maybe someday I will. -or even missed a rainbow to windward and ended up caught in the rain without their foulies on…. ….simply because they were too focused on their glowing screen to recognize their surroundings. Having a greater awareness and connection with nature can be crucial. If you can get a copy of “The Nature Principle” its a great book! Highly recommended. But, no, I’m not a stubborn principled anti-tech maniac! I am typing on a computer, after all! 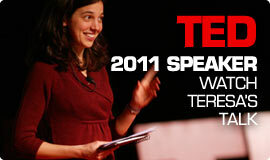 Teresa, I find myself wishing I had that experience that you’ve had. I guess as a racer, the notion of being unaware of the surroundings has been beat out of me. When you race, you do check the basic instruments a lot, but you’re also guaranteed to lose if you miss a wind shift or fail to find a mark, or don’t anticipate and deal with traffic early. In short I just can’t picture ever being so focused on instruments. When the wind pipes up, you can hardly hear yourself think, especially if its at night and you are bashing your brains to windward. In these conditions, Murphy likes kicks in at his best. Sails/lines will snag, and you will have to go to the mast to sort it. If all lines are led aft, you can’t set the line after you untangle the snag. Yelling back to crew in the cockpit is nearly impossible due to wind noise. Imagine you have to set a storm jib or try-sail, are those lines led aft too? What sort of conditions would you expect yourself to be in when you are setting those sails? Would you rather be used to going forward to set/modify sails? Knowing where to stand, where the most useful and comfortable handholds are could be the difference of a quick, simple job and a confusing, terrifying one. Just a quick comment to “all the added friction from the extra routing blocks”. Yes each block adds friction but the most significant factor is the large increase in friction as the load is increased on inexpensive blocks. Most of the cost savings in what appear to be similar max load blocks comes at the expense of a huge increase in friction at high load. Try to get test data on cheap blocks or at least test them yourself on the bench. I noticed you didn’t mention anything about hull material. Obviously, anything that is sturdy, repairable, and well constructed will fit the bill. My own personal bias is towards wood, but I’m curious to know what your inclinations are. I think all materials have their pros and cons, and are also subject to location and type of sailing, ie use. I personally have a crush on Aluminum boats. Metal makes alot of sense to me as far as strength, but I dont know how to work with it. Wood is romantic and smells the best, but I’m a wood butcher. Fiberglass is common and repairable by almost anyone.. even me. Thanks for the comment. Really appreciate the article. So many forums have so many opinions + those that actually know say things like ” look at the boat features and decide for yourself if X or Y is a Blue Water boat “. Except they don’t really say which features to look for. The fact that you can speak from first hand experience is great, add in pictures and clear explanations… this page is getting bookmarked for sure. Great, thanks for commenting. It’s all opinion, as there is no right or wrong for most things. But there are proven features that most of us can agree upon! Amazing Blue Water Boat features! I want that Comfortable Cockpit, because it is a good place of the boat where i can relax and see the beautiful ocean. Great post! I really enjoy this article. 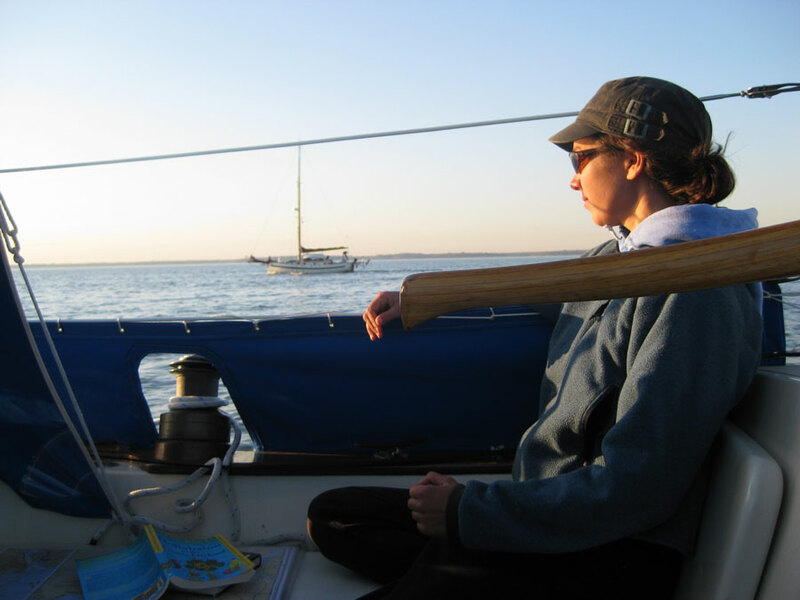 Your boat is fantastic…sailboat cruising explained so well. On chart plotters, I think maybe they are best turned off while out in the open ocean, but I really appreciated having one in front of me while sailing down the coast of California – it had radar & AIS which alerted me to some big fast moving vessels early. Amazing to see that a ship 500 feet long is moving at 20 knots across your path. The chartplotter did ruin my eyesight for night sailing though, and I did not know I was in a pod of hundreds of dolphins until my ears made out the splashing. Good idea on turning it off, or at least covering it up when offshore… I have used a colored gel over them in the past. Reduces the light ALOT, but allows it to be there, and on doing the AIS thing… but the gel is something you need to take off to really get a look at the details. Thanks for the comment.